This easy baked BBQ chicken recipe is a snap to prepare with the quick and easy homemade barbecue sauce. A basic grill seasoning for chicken adds excellent flavor. Serve the chicken with baked potatoes or a potato salad and sliced fresh vegetables for a quick and tasty family meal. If the chicken breasts are very large, you may be able to get by with two. Just slice them horizontally to make four cutlets. You might normally eat a bit more, but according to the National Heart Association, a serving of chicken is about 3 ounces or the size of a computer mouse. Rub the chicken breasts with 2 teaspoons of oil and sprinkle generously all over with the grill seasoning. Arrange in a shallow greased 2-quart baking dish. Combine the remaining ingredients and stir to blend. Cover the baking dish tightly with foil and bake in the preheated oven for 25 to 35 minutes, or until chicken is tender and cooked through. The chicken should register at least 165 F (74 C) -- the minimum safe temperature for chicken according to the USDA -- on an instant-read food thermometer. 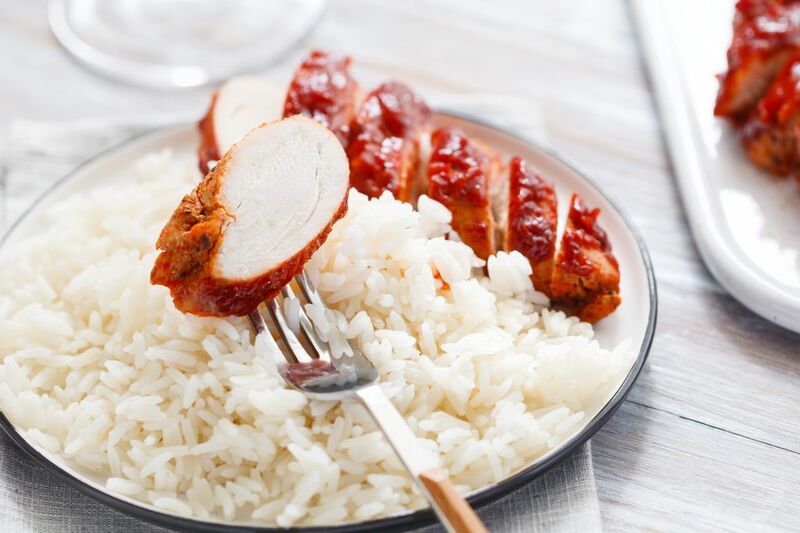 Homemade Spicy Grill Seasoning for Chicken - Combine 2 teaspoons freshly ground black pepper with 1 teaspoon of kosher salt, 1 teaspoon of garlic powder, 1 teaspoon of onion powder, 1 teaspoon of crushed red pepper flakes, and 1 teaspoon of ground coriander. Blend well and store in a small, clean spice jar or container. Makes about 2 tablespoons. For quicker clean-up, line the baking dish with foil and grease the foil. If you're in a hurry or lack the ingredients, use about 1 1/2 cups of your favorite store-bought barbecue sauce. Honey may be used in place of the brown sugar or maple syrup. Slice an onion and arrange it in the baking pan around the chicken breasts.